The Galloway was a small, compact horse from Scotland that is now extinct. They were know for being good pacers. They were gentle, easy to ride and never tired. They were often used for racing. 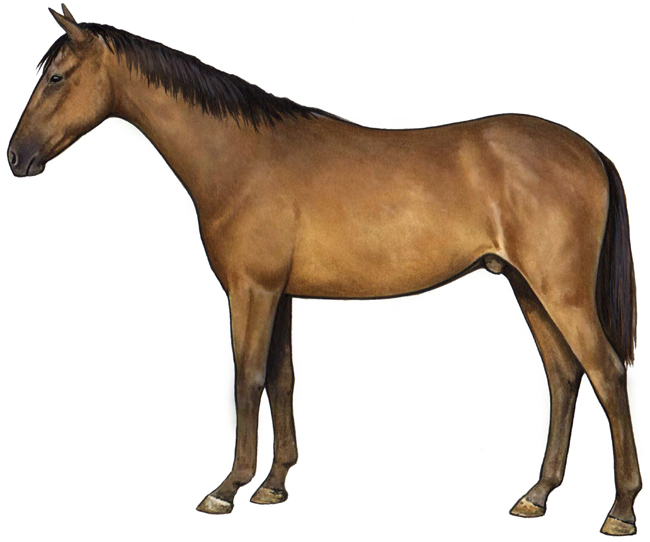 It is the ancestor of the American Saddlebred horse. The easy gaited Galloway was shipped to North America from the British Isles in the 1600s. These hardy little horses thrived and grew in the new environment; through selective breeding the Narragansett Pacer was developed and named for Rhode Island's Narragansett Bay area where many were raised. Before they were all gone, Narragansett mares were crossed with Thoroughbreds, which the colonists began importing from England in the early 1700s. By 1776 during the American Revolution, a horse simply called the American horse had become a recognized type. It had the size and beauty of the Thoroughbred, but retained the ability to learn the easy riding gaits. These animals were used for riding, to pull the plow during the week, the carriage on Saturday night and for other work. They were prized for a pleasant temperament, eagerness, strength and stamina.